Our friends and fans along with local publications, reviewers, and award competitions have honored ASGT with numerous local and regional awards—and we are so grateful for their support. Click the sections below to learn about these recent honors. Thank you for everything you do for ASGT, and for the visual and performing arts communities in our region! The British Players’ prestigious Ruby Griffith Award competition is designed to elevate the quality of local amateur theatre and reward excellence and outstanding achievement. ASGT is deeply honored to have received 2017’s top award for All Round Production Excellence for our 2016 production of The Producers, which capped off our 50th anniversary season, as well as several other nods in recent years. Thanks to The British Players for this honor. This recognition means a lot to our volunteer Board and artistic community! 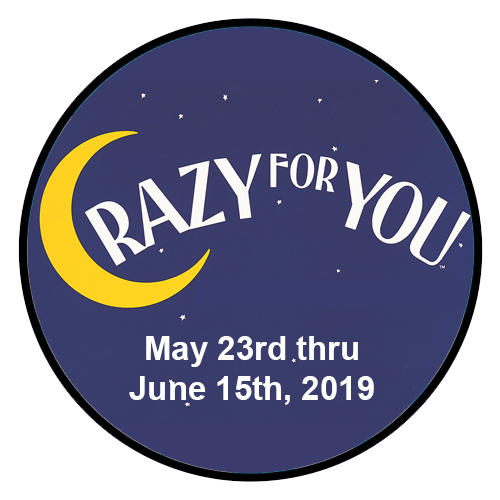 The Capital Gazette‘s annual Readers Choice Awards provide recognition to local establishments, giving readers the opportunity to spread the word about their favorite places. A huge “thank you!” to our friends and fans for voting for ASGT. We’re grateful to have the support of our local community and hometown newspaper. 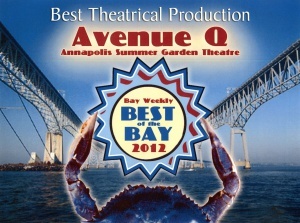 We’re so proud that ASGT and our 2016 artists were nominated in numerous categories of the 2016 BroadwayWorld Baltimore Awards! Congratulations to Athena and Erica—two of our volunteer performers—for their wins in the acting categories. And respect to The Milburn Stone Theatre, who raced with us neck-in-neck to the voting finish, ultimately winning in several categories. Big thanks to all who voted! 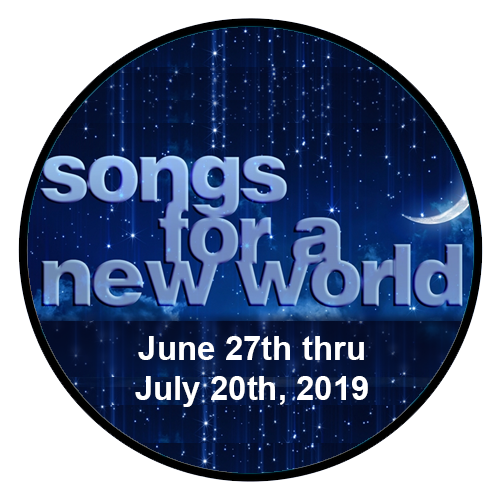 Click here to see a list of all the winners. 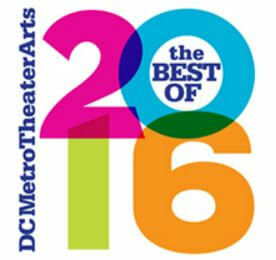 The “Best Of” lists reflect the opinions of members of the writing staff of DC Metro Theater Arts. 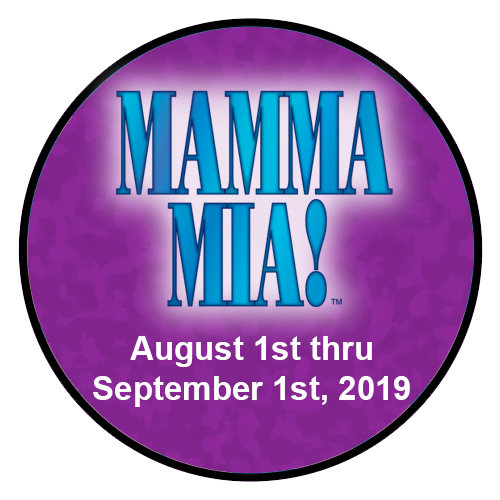 Thank you DCMTA! 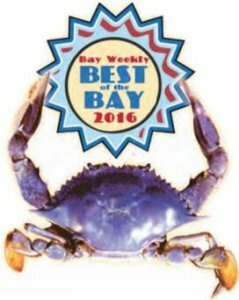 Thank you, Bay Weekly readers, for choosing ASGT and select ASGT productions as some of your favorite things in Chesapeake Country. 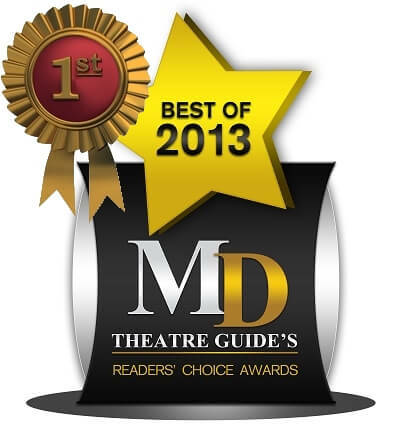 Maryland Theatre Guide‘s Readers’ Choice Awards are designed to honor local performing arts, entertainment, and education organizations for their creativity, talents, and contributions. Over 3,000 votes were cast for the 2013 awards, and ASGT and the cast and crew of 2013’s Into the Woods were proud to be honored in several categories. Thank you friends and fans! In July 2016, ASGT President Carolyn Kirby was recognized in What’s Up? Magazine for her many years of volunteer service to the theatre. 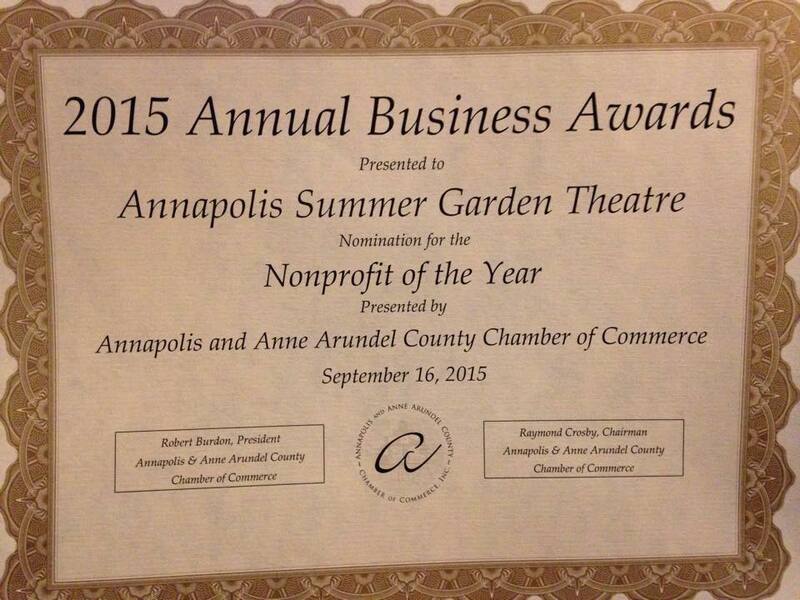 In 2015, ASGT was nominated for Nonprofit of the Year in the Annapolis and Anne Arundel County Chamber of Commerce‘s Annual Business Awards. We were honored to be recognized with this nomination during our 50th performance season. We send our thanks to the Chamber for their support of local businesses, business leaders, and nonprofit organizations. 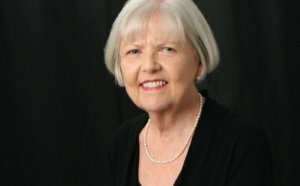 After tallying more than 5,000 votes cast for 42 candidates in its November 2009 contest, the Annapolis & Anne Arundel County Conference and Visitors Bureau (AAACCVB) announced 12 winners, including ASGT President Carolyn Kirby. One of those plaques hangs in our lobby. 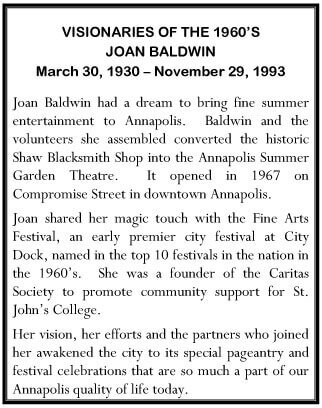 Mayor Ellen Moyer honored the tireless efforts of ASGT founder Joan Baldwin to bring new life to Annapolis historic district in the 1960s. On September 10, 2008 Mayor Moyer, ASGT President Carolyn Kirby, and Joan’s children Jim Baldwin and Meg Baldwin Grasso formally unveiled the plaque honoring Joan and proudly hung it in our lobby. The full text of the plaque appears below. During the Annapolis 300 Celebration, kiosks and other markers were installed throughout the city to help us remember the rich history of the neighborhoods and the people who made Annapolis special. This annual competition asks residents and businesses in Annapolis’ Historic District and parts of Murray Hill to make May Baskets and display them outside their homes or businesses. 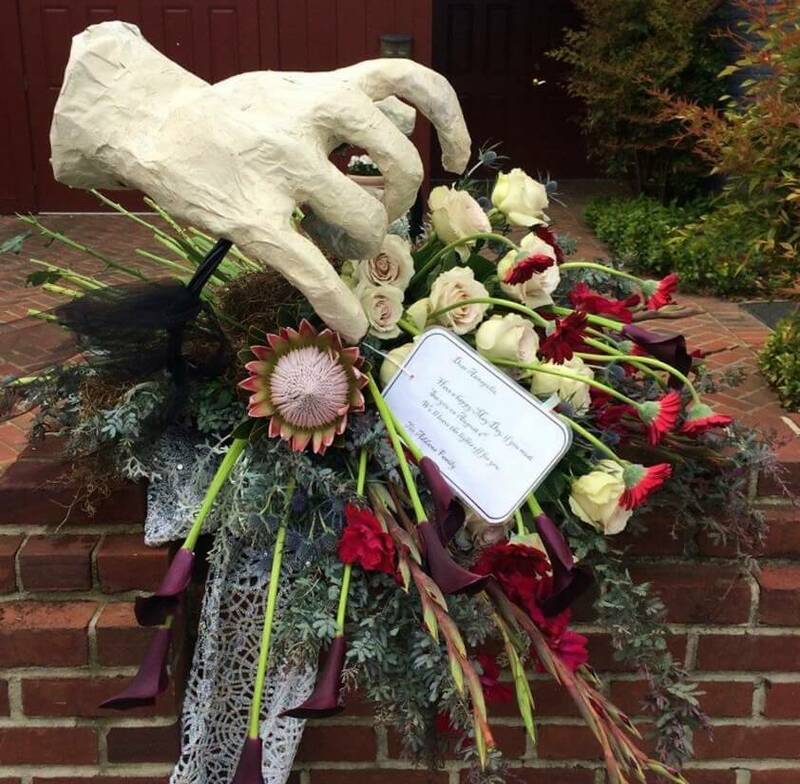 Thanks to the creative stylings of Melissa Huston of Studio H Floral & Event Design, ASGT has been awarded blue ribbons and a People’s Choice Award in this festive local event. Thank you Melissa!